Passed away peacefully at Italian Village Fremantle on 3rd April 2019, aged 83. Much loved husband of Valerie. 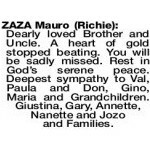 Dearly loved father of Paula, Gino and Maria. 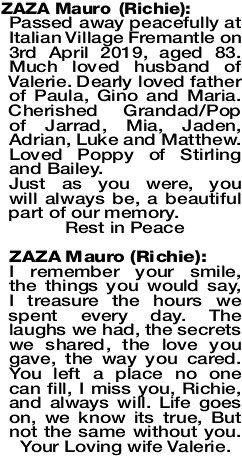 Cherished Grandad/Pop of Jarrad, Mia, Jaden, Adrian, Luke and Matthew. Loved Poppy of Stirling and Bailey. Just as you were, you will always be, a beautiful part of our memory. I remember your smile, the things you would say, I treasure the hours we spent every day. The laughs we had, the secrets we shared, the love you gave, the way you cared. You left a place no one can fill, I miss you, Richie, and always will. Life goes on, we know its true, But not the same without you. Your Loving wife Valerie. 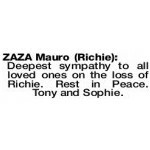 The Funeral Service for Mr Mauro (Richie) Zaza of Leeming, will take place in our Chapel, 312 South Street, Hilton commencing at 10:00am on SATURDAY (13.04.2019). Dearly loved Brother and Uncle. A heart of gold stopped beating. You will be sadly missed. Rest in God's serene peace. Deepest sympathy to Val, Paula and Don, Gino, Maria and Grandchildren. Giustina, Gary, Annette, Nanette and Jozo and Families. Sadly we say goodbye to a wonderful brother and uncle. 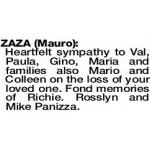 Deepest sympathy to Val, Paula, Don, Gino, Maria and families. 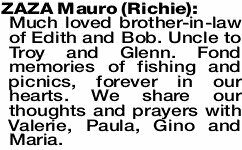 Much loved and respected brother and brother-in-law of Mario and Colleen. Loving uncle to Lita and Tony, Ricky (dec), Darralynn and Leigh, M.J. and Mellissa and their families. Heartfelt sympathy to Val, Paula and Don, Gino, Maria and families. Farewell Richie. We will remember all the happy times. 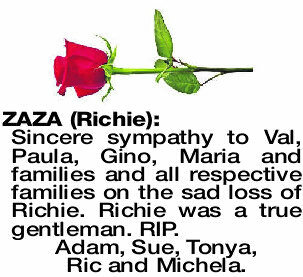 ZAZA RICHIE Deepest sympathy to Val, Paula, Don, Gino, Maria and families on your sad loss of Richie. 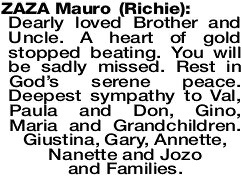 ZAZA Mauro RICHIE Much loved brother-in-law of Edith and Bob. Uncle to Troy and Glenn. 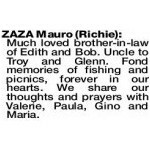 Fond memories of fishing and picnics, forever in our hearts. 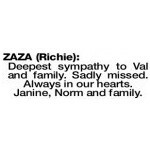 We share our thoughts and prayers with Valerie, Paula, Gino and Maria. 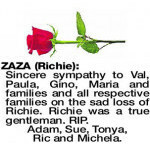 Sincere sympathy to Val, Paula, Gino, Maria and families and all respective families on the sad loss of Richie. Richie was a true gentleman. RIP. Adam, Sue, Tonya, Ric and Michela. 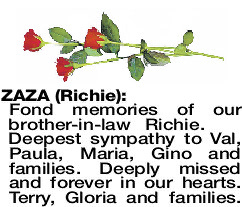 Fond memories of our brother-in-law Richie. Deepest sympathy to Val, Paula, Maria, Gino and families. Deeply missed and forever in our hearts. Terry, Gloria and families. 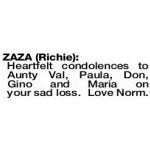 Heartfelt condolences to Aunty Val, Paula, Don, Gino and Maria on your sad loss. Love Norm. 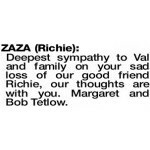 Deepest sympathy to Aunty Val, Paula, Don, Gino and Maria. Treasured memories of you always. John, Nella and families. Deepest sympathy to Val and family. Cherished memories. From Kay and Graeme and family. Heartfelt sympathy to Val, Paula, Gino, Maria and families also Mario and Colleen on the loss of your loved one. Fond memories of Richie. Rosslyn and Mike Panizza. 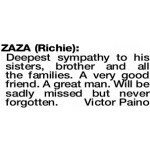 ZAZA RICHIE A true, wonderful gentleman. In our youth for many years, a mentor and very close, good friend. My heartfelt sympathy to his wife Valerie, children Paula, Gino, Maria and families. 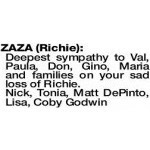 Also, my condolences to his brother Mario and Colleen, and all respective Zaza families, on the sad passing of your loved one, Richie. Deepest sympathy to Val and family. Sadly missed. Always in our hearts. Janine, Norm and family. In loving memory of compare Richie. Deepest sympathy to Val and all the family. Always remembered. Victor and Nancy Tomba. 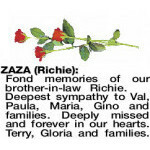 ZAZA RICHIE Thinking of you Maria, we love you. Aly and James. 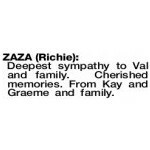 Deepest sympathy to Val and family on your sad loss of our good friend Richie, our thoughts are with you. Margaret and Bob Tetlow. 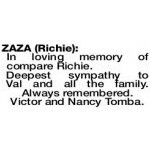 Deepest sympathy to all loved ones on the loss of Richie. Rest in Peace. Tony and Sophie.